Due to its extensive experience, ZAGO is now introducing the new generation of King Lion horizontal self-propelled T.M.R feed-mixers: a high quality, reliable and high performance product, specifically designed for medium-large sized farms. King Lion adopts the patented FREE FLOW MIX feed- mixer system that guarantees exceptional Unifeed/TMR ration homogeneity, maintaining the nutritional properties of the single ingredients. The chassis mounted on sturdy trestle sections is equipped with a 4- sensor weighing system. The reduced axle base provides easy manoeuvrability even in tight passages. The miller cutter, 200cm wide, guarantees high performance and maximum load speed in both rotation directions thanks to the 90cm wide in-feed conveyor. 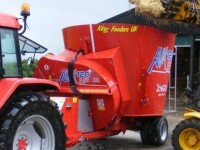 The two 95 kW piston motors allow for flour, long fibres, grass silage, straw and various other silage to be loaded, maintaining their structure. Available with various drives from 129 kW, 6 cylinders stage 3: Iveco Nef, John Deere, Deutz, Perkins. The King Lion series is available in 15,17 and 21 cubic metres.